organize, advocate, and design spaces of racial, social and cultural equity. 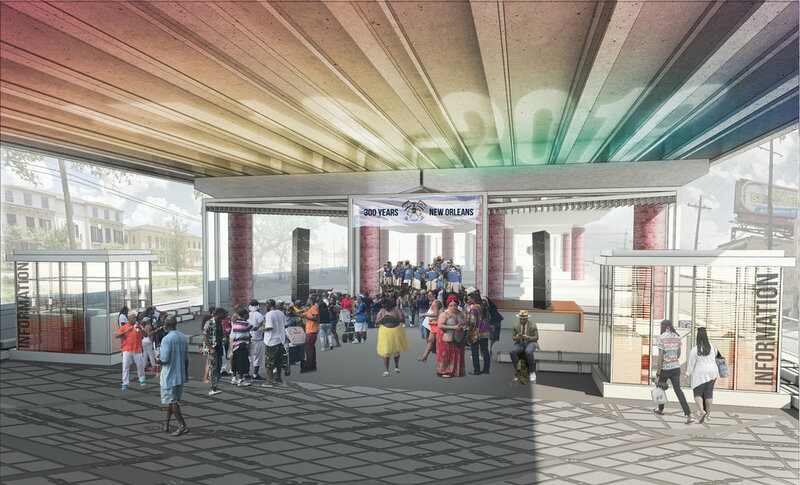 The CLAIBORNE CULTURAL INNOVATION DISTRICT (CID) is a 19-Block transformation of space beneath the elevated I-10 expressway along Claiborne Avenue, from Canal Street to St. Bernard Avenue. Built with green infrastructure, in addition to being a world-class market with arts, crafts, produce and seafood vendors, the CID will include classrooms and exhibit space, interactive technology and education demonstrations, and will be a site for youth programming, health, environmental, and social services, community projects, workshops, and special events for the residents of the Claiborne Corridor. As a culture based economic driver, the CID will support indigenous entrepreneurs and culture bearers in achieving their goals for equitable and sustainable community development. Heavy on innovation, it will be a resident governed effort focused on providing direct pathways to business ownership, workforce development, and community capacity building, through fulfilling the need for neighborhood serving retail and enhanced neighborhood services. Through the process the community expressed a want to maintain flexibility within the space as well as a need to mitigate sound pollution. Given the limitation of attaching to the structure and the structural requirements for the overall production of the space an articulated canopy serve all of these purposes well. Stages will be built to accommodate music, dance, and any other performances by the community. The infrastructure and space surrounding the space can also be used as a blank canvas for street murals done by local artists.There will be exhibits, demonstrations, and public art, integrated into all aspects of the CID. This will include both standard technology—audio, video—and innovative technology - renewable energy, 3D printing, advanced manufacturing tools. How it all ultimately manifests will be part of the community decision-making in the design process. This will be a clock tower reflecting the humans that represent the neighborhoods along Claiborne Avenue. As a prevailing symbol of the people, places, movements, and events that serve to define the timeline of this neighborhood. The establishment of a commercial corridor where business development and training are provided in place, sets up the CID as a unique experience for New Orleans entrepreneurs and business owners, and defines new, culturally relevant pathways to success. The programming strategy is to assist the development and promotion of equity for New Orleans’ indigenous cultural community. An outdoor marketplace can fosters the growth of small businesses either owned by those indigenous to the Claiborne area or directly serving the Claiborne community. The NAC is made up of residents and business owners who advise with respect to whether programming and policies of the CID are meeting the specialized economic, cultural and educational needs of the communities served by the CID, and may make recommendations on how to meet those needs. By integrating functionality with ecological balance, we will re-create the space in a way that benefits community growth, public health, the environment, and transportation. Using renewable energy, storm water management and eco-friendly construction we will make our stretch of the I-10, in effect, a “green highway”.